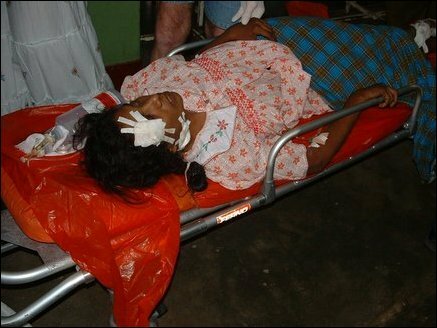 Nine civilians fleeing from a Sri Lanka Army offensive towards Chilaavaththu'rai in Liberation Tigers of Tamileelam (LTTE) controlled territory in Musali, Mannaar, were killed and six including children wounded in a Claymore attack carried out by Sri Lanka Army (SLA) Deep Penetration Unit (DPU) Saturday at 8:35 a.m. Two ambulances sent from Mannaar hospital to transport the wounded were blocked at Chi'rukka'ndal SLA camp. It has taken more than 6 hours to transport the wounded towards Mannaar hospital through a separate route via Achchangku'lam, medical sources said. 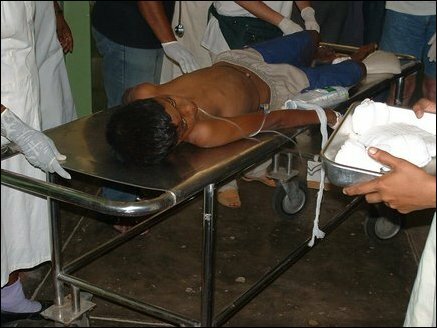 10-year-old Balamayooran Sebastiampillai was taken to Mannaar hospital after 6 hours of the attack. Three of the wounded IDPs were children. 15 civilians were fleeing in a van from a fresh offensive operation begun by the SLA from Murungkan towards Chilavaththu'rai. The attack took place at Paasiththen'ral. 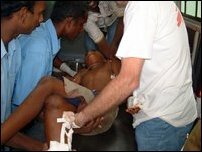 3 children were among the wounded. Two of the wounded, admitted at Mannaar hospital, were identified as Barathy Harishchandran, 29, with severe injuries to her leg, and 10-year-old Balamayooran Sebastiampillai. Four wounded were admitted at Murungkan hospital. 7 dead bodies were lying on the spot, according to the information provided by the fleeing civilians. One dead body is kept at Chilaavattu'rai hospital. 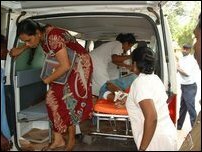 Meanwhile, military sources in Colombo said a soldier was killed in the offensive Saturday morning. According to the military, the operation was a "humanitarin operation" in Chilavaththu'rai to "liberate civilians from LTTE clutches". Hundreds of civilians have fled towards Arippu church seeking safety. Barathy Harischandran, 29, was wounded in her leg. Two of the wounded were admitted at Mannaar hospital.